I love soup. Soupy, soup soup. And when turkey time of year rolls around, I get a little flutter of glee because I know that I’m going to score me some delicious turkey soup. And it will cost nada. You have to make it, but who cares? Pay attention to me, grasshopper, and I will teach you the way of the free-soup ninja. If you’re like most people in the world, you’ll be invited to a “traditional” Thanksgiving meal where your mom/mother-in-law/one of the aunts will have estimated that they need to have approximately 5 pounds of turkey per person, including all the kids, which make up 25% of the attending demographic. There will be mashed potatoes. About 20 pounds of them. They will all have to be peeled en masse by the entire female contingent because OMG you can’t make mashed potatoes with peels on them. Aunt Marnie hates potato peels. Therefore, no extra fiber, taste and nutrients for anybody. Same with the 10 pounds of carrots. Peel, peel, peel. There will also be about a gallon each of boiled peas and corn, because your elders were raised as kids in the 50s and their parents didn’t know any better about serving vegetables. That generation made approximately 8,836 recipes involving mayo, Jello and canned tuna-fish. ‘Nuff said. The kids will all eat approximately .25oz of turkey, two bites of mashed potatoes and ignore every vegetable, leaving almost exactly enough food to feed a college football team. If you ask for it, you will get it. I always, always walk home with the bird carcass from any family gathering. Nobody ever fights me for it because nobody knows how to make delicious soup from it. Or they can’t be bothered. Their loss! 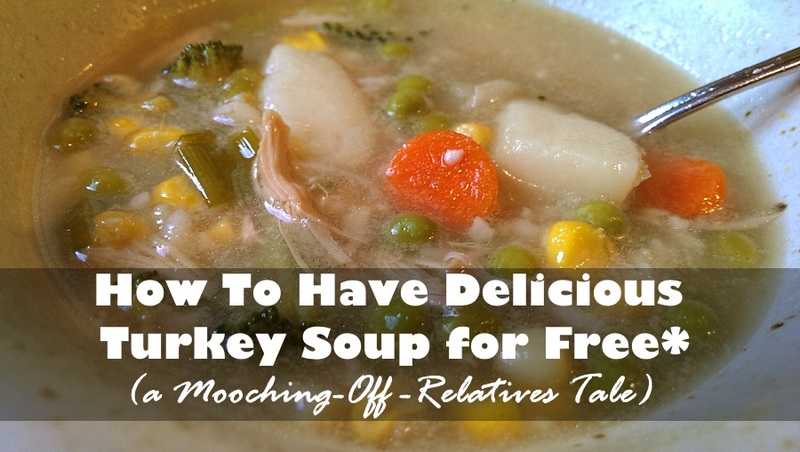 Considering you can end up with about 10 quarts of stock or more from the typical Franken-turkey your family will usually buy… Everybody got time fo dat! This is also an excellent way to escape a family gathering without being burdened with 10 pounds of dried out turkey meat leftovers. Leave that for the lazy people. The wily soup-crafter will need to come armed to this family event, and will have to forage strategically along the way. If you aren’t cooking the bird and you know you will get the carcass, come to dinner already armed with the stock pot. Hey, the less you have to touch it, the better. And then, make sure you have your attack plan. Depending on the size of the turkey, you may have to get up early to snag the neck if it’s not being used for other purposes. The other gizzard bits? Take ’em or leave ’em. I usually leave them. Also snag any fatty extra pieces of skin being cut off the uncooked carcass. Put everything in a Ziploc bag and hide in the freezer till later. Or the fridge, if you can find more than 2 inches of space. That Aunt Marnie who hates carrot and potato peels is going to be your blessing in disguise. Be a big helper by cleaning up all the carrot peels and a good double handful of the potato peels—by putting them in your stock pot. If someone there has a useful obsession with eating celery as an appetizer, steal the leafy green bits and the ugly dented up outer stalks. Stock pot. Cutting up onion for stuffing? Outer onion peels (as long as they’re not moldy or anything) and leftover onion bits in the pot. Pour a couple of inches of water in your stockpot to keep the potato peels from going all oxidized weird and shove your pot out of the way until after dinner. Now why, you may ask me, do you want to save the vegetable scraps? Because any vegetable you cook long enough to make stock with is going to get mushy and tossed anyway, and the scraps will impart all the very same desirable flavours you want without wasting the good stuff. People are old school about carving turkey. I’m pretty sure it’s Norman Rockwell’s fault. Yeah it looks cool to carve neat slices off the bird while it’s sitting on the table leaking grease everywhere, but it’s an inefficient Pain In The @ss. Turkey’s getting cold, yo. Toss that little electric cutter thing out the window and remove the breasts whole by running a sharp knife down from the top of the breasts along the rib cage. Then pull back the turkey leg and sever the whole darn thing at the hips. THEN hand them over to Uncle Joe to slice up, which can be done neatly. You can carve up a 25 pound turkey this way in about three minutes flat, no joke. You should be left with the wings and a relatively meat-free chest cavity, and whatever meat is on the backside. While Uncle Joe is occupied and possibly grumbling about this emasculated but highly efficient form of butchering, toss what remains of the carcass in your stock pot. Also make sure you salvage the big bones from the thigh and drumstick carving. If you lost the carving battle (darn those traditionalists! ), while everyone’s doing dishes and people are finishing picking the meat off the turkey, immediately toss any big bones from the legs that may have been separated straight into the pot, stripped of meat. Grab the wings and their tips and the leg bones. Grab the fatty bits of skin. 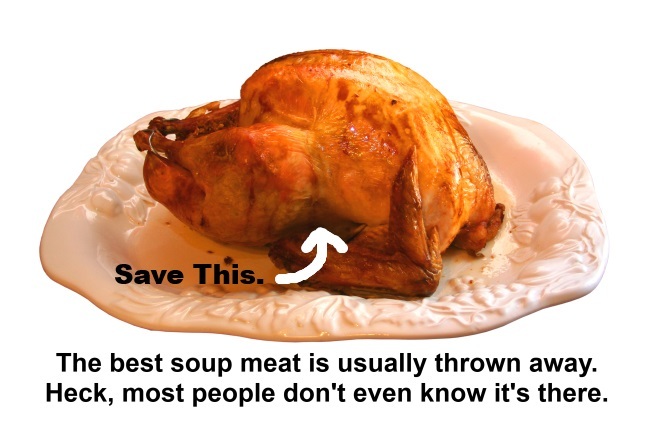 Most importantly, keep the back of the turkey and all the meat and skin on it. What DON’T you want? Any meat (other than the wings) that’s visible on the front side of the turkey. DO NOT WANT. Cut that stuff off and save it for sandwiches, or whatever. I can’t tell you how often I’ve seen the back of the chicken or turkey just tossed. This is where the oyster is and all the other meat that’s the perfect texture for soup. It seems to be no small coincidence that there’s almost always more than enough of this meat to make a rich, meaty soup out of every drop of stock you can create. I like to call it the “grey” meat, because it looks somewhere halfway between white and dark, most of it is a bit lighter than the thigh. Ironically, or maybe not so ironically, the French call the oyster of a bird sot-l’y-laisse. If you’ve got a pile of leftover cooked carrots, corn and peas, (really who never has this problem?) snag them and bag them. There’s nothing wrong with these but the fact that they’re pre-cooked. You will add them to your soup at the end, after you’ve stocked the carcass, so they don’t get mooshed. Once you’ve salvaged the back and bones and wings and skin, add any remaining vegetables scraps, the neck and skin parts if you have them, and fill your pot to the brim with water. The bigger the bird, the longer this part will take. The longer you make the process take, the better it will taste. Turkey never needs more water added like a chicken carcass does, or as much help to taste great, and sometimes I’ll let my 16 QT stockpot go on and off for a couple of days. Either way, when it’s done the carcass should pretty much fall to pieces. Let the mixture cool a few hours or up to overnight, and set a colander over the top of another pot or a large Tupperware tub. Then carefully pour your mixture through. Get a large bowl, and line it with a compost bag. Get another bowl for your meat. If this is your very first time, you absolutely must do this bare-handed. 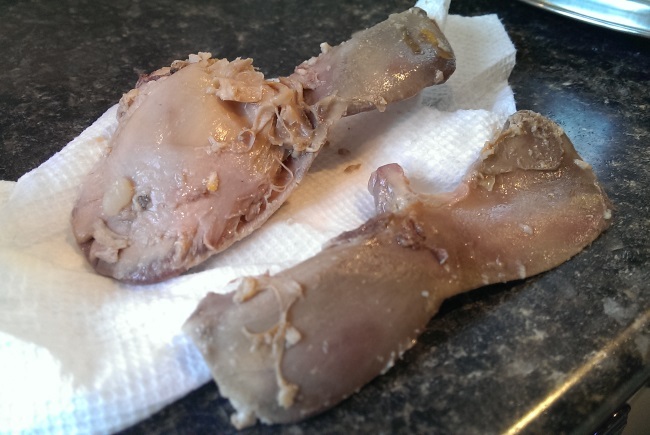 I know it’s yucky, but your fingers will be able to sort the best meat by texture! What are you looking for in the best meat? If you’re not sure, go looking for the oyster. The oyster is an oyster-shaped piece of meat that is attached to this bone. It’s normally found near the hip of the bird, for whatever that might be worth at this late stage. Dig your thumbs into the oyster. It will feel meaty and split apart into moist strands. This is your grade-A soup meat, and the best stuff will feel like this. Discard all the cooked veggies, bones, and meat that feels slimy or crumbly. Now you’re probably dealing with way more soup than you’ll want to make at once. That’s fine! Divvy some of the meat and broth up in a couple freezer containers for insta-soup. And then make yourself some soup for now by heating up a pot of broth and meat to boiling, throwing in some barley and rice, and once the grains are cooked, adding the leftover peas, corn, and carrots that everyone was so relieved you volunteered you take. You’re done! You’ve got soup, baby! And it tastes like delicious and FREE. This is great, we love to make Turkey soup but this w-end my mom is not doing the traditional Turkey, so there will not be any leftovers for us. That’s totally a reason for a sadface. Deeeeelicious! 😀 I can hardly wait to make turkey soup now!